My little man is a complicated case. His condition is compounded by a number of other issues. Max was diagnosed with Idiopathic Early Onset Scoliosis. It is likely to be caused by genetic and neuromuscular factors but this is not known. He has a micro deletion of chromosome 6q16.1 however this region contains no human disease genes and is unlikely to be the cause of his problems. So Max is currently a SWAN (Syndrome Without a Name). He has a likely – but undiagnosed genetic syndrome, meaning we cannot identify any common patterns or expectations. 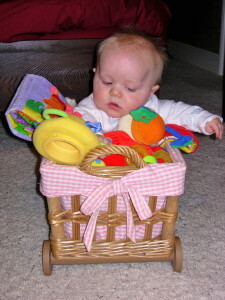 A basket was the only way to support Max with reachable toys! 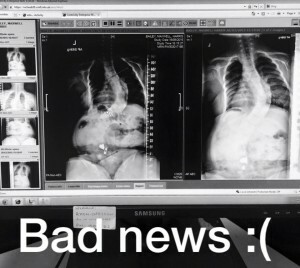 A skeletal audit at age 3 found a slight curve in his spine. It was noted and disregarded as young children will often grow out of it. 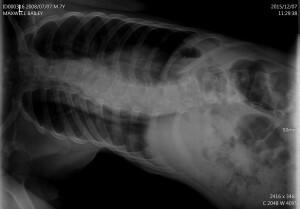 Part of Max’s complications are however that he has Central Hypertonia (low tone). He was our ‘floppy baby’. This means he’s never had the strength to hold himself correctly. He is now weight bearing but cannot walk independently. Even now at age 8 he is like a cruising toddler, dependent on furniture or momentum to get about. He doesn’t have the ‘saving’ action that you and I have so won’t think to put a hand or foot out to catch himself. So he’s not safe nor independent and spends a lot of time sitting. Gravity is not his friend, compounding his low tone and slumped posture. Added to this he has a condition called Ocular Albanism with a rotational nystagmus, and ptosis. Ocular Albanism means that he has areas of his iris with no pigmentation where he cannot process visual input, so does not see these patches. His nystagmus is an eye wobble, and ptosis is a drooping of the upper eyelid that can partially cover his pupil. Max manages all of these conditions through combination of steadying his gaze by looking down, then lifting his chin which shifts weight into the back of his head, and often twisting his head so that he is looking forward predominantly from one eye. Again, this all impacts really badly on his posture. At age 5 Max gained confidence in walking but had set-backs. It was amazing to see Max start to walk and connect more with his environment. He became more confident and sociable. I was such a proud mummy and it was exciting times. Then two things became a problem; Max suffers from Rhizomelic Limb Shortening – he points his toes due to shortened achilles. This was such problem for him that I was under pressure to accept surgery to help him plant his heals to assist his posture and walking. At this time his spine was rapidly curving and twisting in all three dimensions. Can you imagine trying to walk with a twisted, bendy back and on tip toes?! I refused the surgery and managed the condition holistically. He’s had two rounds of serial plaster casting that have taken him off his feet for months. He will likely have more. It worked, he now wears splints and plant this heals when walking. So I’ve proven surgery wrong before and this time it’s far more invasive with much worse repercussion. At age 8 Max’s curve was observed to have dangerously increased. In the UK the first element of ‘treatment’ is observation. His consultant is not a fan of bracing citing there is little evidence that it works. So, from diagnosis at age 4 we continued to monitor every 6 months until September 2015 when X-rays revealed a rapid increase from around 50% to a 70 % cob angle. This is the ‘bad news ‘ post I put on Facebook. He has now been referred for surgery before his curve impacts his internal organs, with the potential to become life threatening. For Max, surgery in the UK means inserting metal rods along the length of his spine. It’s nasty, invasive surgery leaving a scar the full length of his back. He will require repeated surgeries every 3 to 6 months to lengthen the rods through his growth spurt from age 8 until12 and beyond. Ultimately, when he finishes growing or the rods fail, he’ll likely require his spine fused solid and be left with life-long disability and pain management. Since Max’s diagnosis I have spent countless hours scouring the internet, reading forums watching YouTube, trying to find answers. There is currently very little awareness of scoliosis and research is very bias towards bettering the surgery. We’ve explored ‘alternate’ therapies available in the UK aimed at improving the health of the spine and neural messaging. These include energy therapies, chiropractic and osteopathy, bio-machics and hyperbaric oxygen therapy. I wholly believe that conservative and holistic therapies have improved Max’s condition. He always leaves a therapy session stronger thinking he’s a superhero! Max’s x-ray laying on a Scoliroll – a massive reduciton! We’ve tried to create our own program for Max but all these therapies are dis-jointed, work in isolation and are a financial burden. We’ve visited ScolisisSOS to explore a managed therapy program but all of Max’s issues combined with his developmental delay and learning difficulties mean that he cannot ‘own’ a scoliosis therapy and management program. He simply isn’t capable. He needs to be worked on passively or at least not dependent on intense physical input from him. America has dedicated, multi-disciplinary scoliosis centres addressing physical, neurological and genetic influences. I’ve had private x-rays taken showing that Max has a flexible spine capable of curve reduction of around 50% on both his thoracic and lumbar. There is a route to a better outcome for him and I need to give him that opportunity. Despite all his issues Max is a very willing and cooperative little boy. We work hard on what we affectionately call his ’bendy back’ and general physical function. He’s getting stronger and more confident in his walking every day – without surgery!